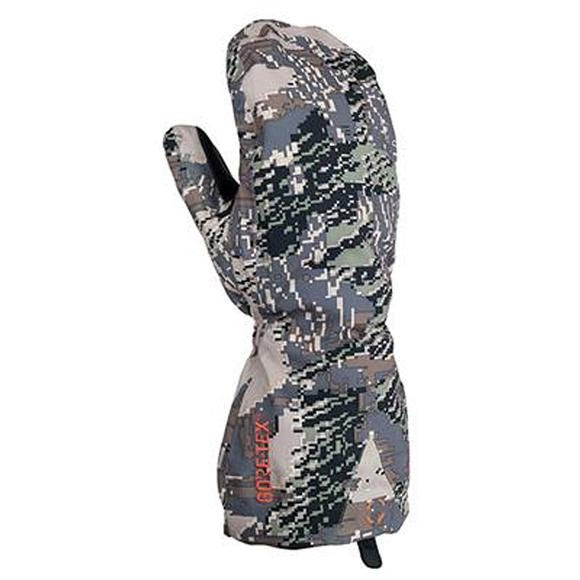 The Sitka Gear Blizzard GTX Mitten is for hunters who leave no stone unturned when glassing for game and thrive when the weather is at its worse. A rugged waterproof Gore-Tex® Shell seals out snow and rain while a removable PrimaLoft® insulated liner provides critical warmth in the coldest conditions. The Sitka Gear Blizzard GTX Mitten is for hunters who leave no stone unturned when glassing for game and thrive when the weather is at its worse. A rugged waterproof Gore-Tex® Shell seals out snow and rain while a removable PrimaLoft® insulated liner provides critical warmth in the coldest conditions. Articulated patterning improves dexterity and synthetic leather palms provide tacky grip that won&apos;t absorb water in freeze-thaw cycles. The shell and liner secure with a velcro connection and can also be worn independently to adapt to the fluid conditions of big game pursuits. Waterproof and breathable Gore-Tex® 3-layer laminate keeps you completely dry inside and out. High-grip leather palm gives you complete control over your bow, rifle or walking sticks. PrimaLoft is a patented ultra fine microfiber blend that is incredibly soft, lightweight and water repellent. PrimaLoft synthetic insulation absorbs three times less water, is 15% warmer when dry and is 24% warmer when wet that the closest competitive insulation. In addition to these impressive thermal properties, PrimaLoft is lightweight with a down-like softness that adds comfort and appeal and makes it highly packable.